I wanted to do a little more research for you and see which subs were being offered for $5 or less. The only way to do this online is to register for a pick-up/delivery account on their website. So I did that. Then I started to navigate through the ordering process and started to try and find the inexpensive subs. Before I tell you what I found, let me tell you a little about the Quizno's ordering website. It is S-L-O-W. Once you click a category that you want to order from (ie. Subs, Sammies, Bowls, etc) the previous category items remain there from quite awhile after the heading for your new category appears at the top, which is a bit confusing in addition to being slow. It would certainly be quicker to pick up the phone and order that way. And you might have to order by phone anyway... the three Quizno's closest to me did not offer online ordering for pick-up or delivery. That seems to defeat the purpose of offering online ordering. Essentially the 'small' size of all the subs I could find on the pick-up/delivery ordering website were between $4.39 and $4.99. There were not medium or large subs of any variety that were priced under $5. 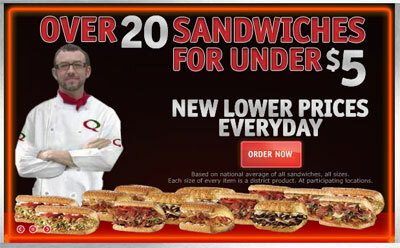 Quizno's has been suffering since Subway started their $5 footlong promotion. Subway offers 6" and footlong (12") subs. Quizno's small sub is substantially shorter than 6 inches, so comparing it in size or price to a Subway sandwich isn't useful. All of what you say might be true but Subway is gross so I wouldn't pay half Quiznos price for it. Yea, subway might be a cheaper, but you get wat you pay for. Quiznos taste way better. Get your facts straight. Quiznos' small sub isn't substantially smaller than a 6" at Subway. It's 5.5", and comes with better quality meats and cheeses. Go to Subway if you want that extra half inch of vegetables. I ordered online from them once and the process was buggy, but worked. I just tried ordering online again and spent over half an hour waiting for each page to load, before it finally timed out repeatedly at the final part of the ordering process. For such a big chain with such a big marketing presence, you'd think their site would at least..you know..work.